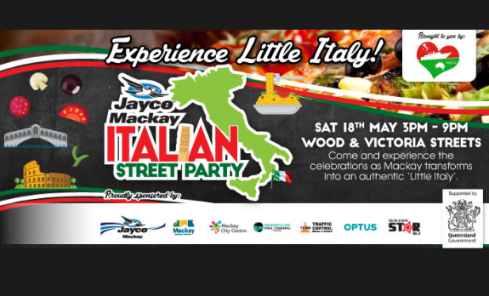 The Jayco Mackay Italian Street Party will be back in 2019, this year held on Saturday, May 18, from 3pm – 9pm. The Wood and Victoria Street cross section will once again be closed to traffic and transformed into “Little Italy” for the night. The Mackay and District Italian Association encourage all City Centre business to decorate their premise ‘Italian Style’ including signature colours of red, white and green. Businesses are also urged to put on a special promotion for the day potentially serving some Italian food or drinks. This year a substantial amount has been spent on marketing the event including use of platforms such as Facebook, Instagram, Google Adds, a brand new website with a live social media stream, radio adds, press adds and a TV commercial. So, if any businesses have photos of Italian – food, drinks, decorations etc, please send it through to the committee so they can promote your businesses offer. If you would like a stall on the night please fill out the Expression of Interest form HERE and send it through to Mackayitalianstreetparty@gmail.com by the end of April. Please note that the stalls must have some kind of Italian theme. Committee members plan to drop off information packs to as many businesses as possible, but if you don’t get one and would like some information please then an email or call the Event Coordinator: Sophie Bonanno on 0431246637. A large reason for this event is helping to activate Mackay City Centre and your businesses so please let the team know if there is anything you would like to do to contribute to the day.